Ethnos rode into town on an impressive wave of hype. For me however those frothy waters broke without leaving much of a damp patch. Urgh. That’s a horrible way to introduce a teardown. Can I start again? What do you mean this is live? Oh God. We gave Ethnos three stars in our review – it’s a collection of nice ideas that just don’t work very well together. At its best it is very playable. At its average it is structurally unsound. But as usual you shouldn’t let our muted views put you off of a game if you fancy the look of it. If you want to play Ethnos though the question that really matters is whether the game is actually playable? Let’s discard a handful of accessibility analyses onto the table for you to paw through and pick up at your leisure. Colour blindness isn’t especially well supported, but it’s also not necessarily a significant problem. 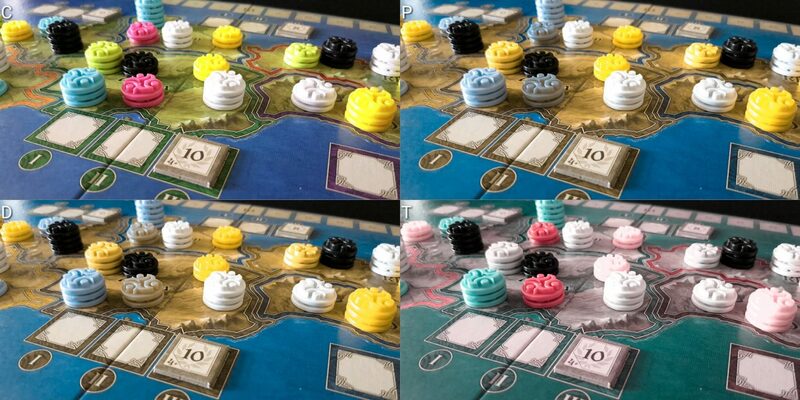 Ethnos plays up to six players, and as such there are six different colour markers to use. Black and white are present, and those are almost always safe choices. A workable combination of the others is almost certainly possible in most circumstances. Primarily the problems are to be found in the green and yellow for Protanopes and Deuteranopes. 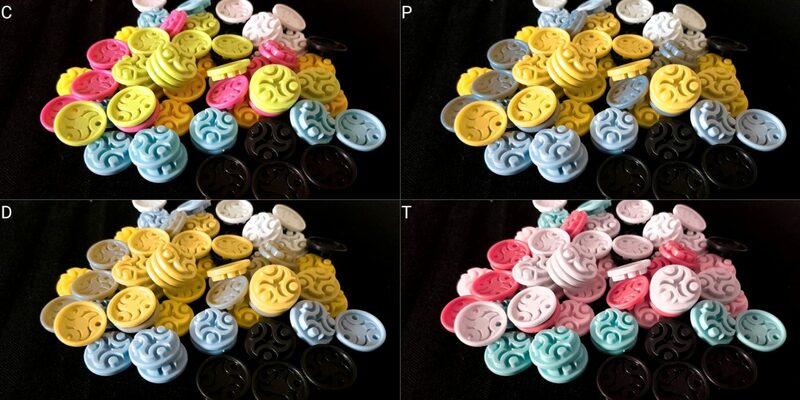 Other colour combinations may be problematic too depending on lighting considerations. Mostly it’s okay but really the thing that would push it from ‘mostly okay’ into ‘definitely fine’ would be a differing icon on each of the different player markers. They are physically identical here except for the colour they use. The markers are used in the main part to indicate score, progress on the various additional race boards, and control of an area. They can’t be easily substituted for other tokens given the multiple uses they have and the number you need to replace but in a pinch you could use coins. It’s not ideal, but it’s a possibility. Regions on the board are indicated by the colour of their border, as are the cards that represent them. Here though there are no serious problems – each region of the board has a name to go with it, and that’s mirrored in the deck. The regions of the board don’t move around and so their locations are learnable. There is sufficient redundancy of information here to support those with colour blindness. 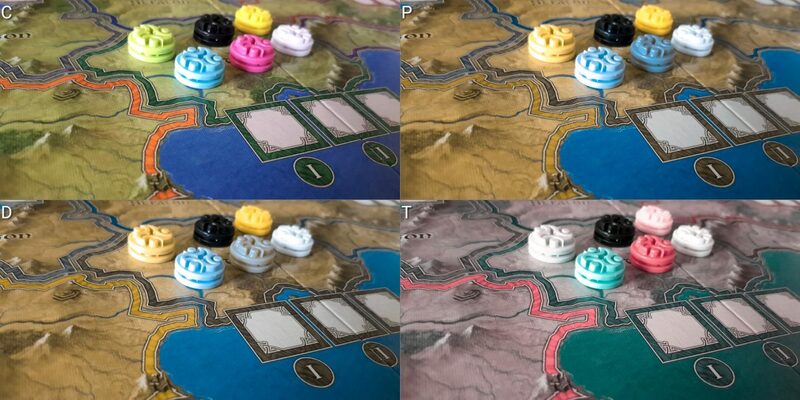 The main issue of colour blindness then comes in with identifying control of regions on the board at a distance – with close inspection the colours are likely differentiable but that close inspection may end up leaking gameplay information. Paying too much attention to Pelagon will just make other players wonder about why. 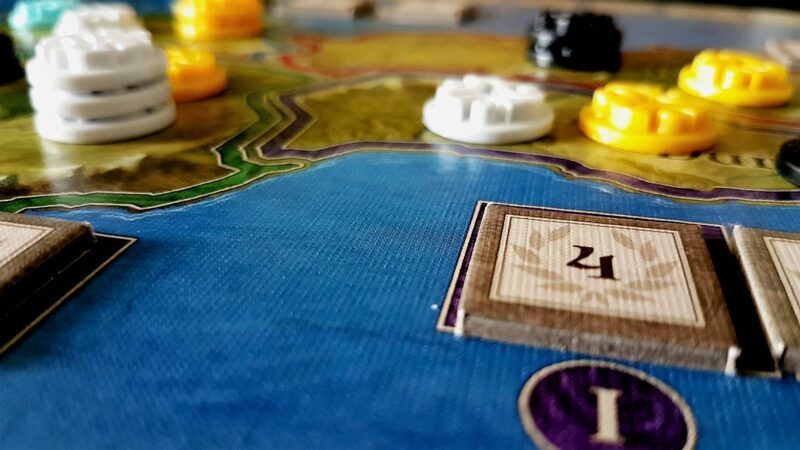 We’ll recommend Ethnos in this category – it’s not a flawless performance but what issues exist can be worked around for the most part if the will is there and the player count is flexible. There’s a significant degree of tactility to much of the game state – different races use different boards to track progress, and the markers are a physical indicator of presence in areas. There are only six regions and the geography of the board is fixed. It’s not possible to tell one marker apart from another by touch, but you could assess things like relative control of areas and territories by inquiring of the table. In theory at least – in practice the tokens don’t have the heft to permit that to be done safely. 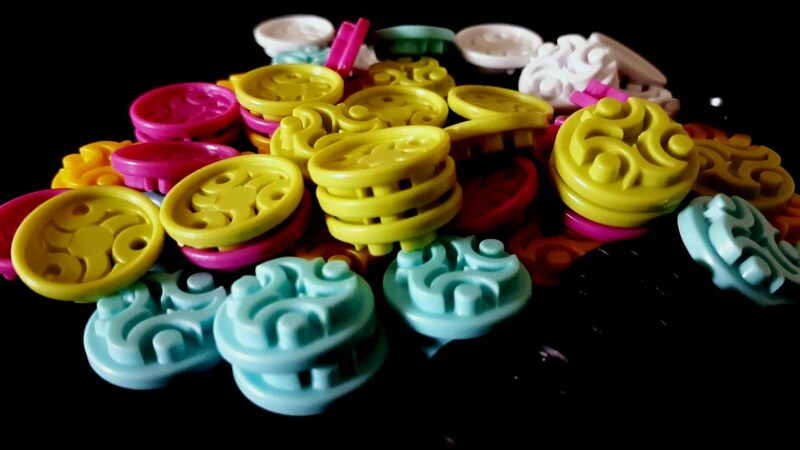 One false move and you’ll upset a stack of tokens and then have to chase them around to replace them where they were. Better quality components with unique icons for each player would have gone a very long way towards offering a considerable degree of visual accessibility. The only other components in the game are the cards, and these are reasonably accessible for those with some degree of ability to differentiate visual information. Card names are well contrasted, even if the cards are a little on the small side. Colours are used to provide territorial cues if the ornate font on the region is not readable. They do come with some text, but there are only twelve possible races and the effects are not complex or especially wordy. Each card also comes with distinctive art, although the colour palette trends towards brown and drab so it’s not necessarily as useful a visual cue as one might hope. Close inspection with an assistive aid should permit a player to work with the hidden hand of cards although since the hand limit is ten and that’s quite a lot it may be somewhat cumbersome. Many of the decisions players make in the game are going to be mediated by the card supply that everyone is feeding into. The churn that will be experienced here may be significant (depending on race combinations) or it may be negligible. For many games your only real decisions are to draw a random card or play a warband. This keeps the need to track the supply to a manageable level on average. Some of the game boards and tokens have visual information presented that needs to be taken into account as play progresses. For example, the Merfolk board has some spaces marked with an icon that means you can place a marker somewhere on the main map. These additional gameplay indicators are sometimes very poorly contrasted against the space of the board itself and sighted aid may be required to make sure this is handled correctly. Under the sea. Under the sea. 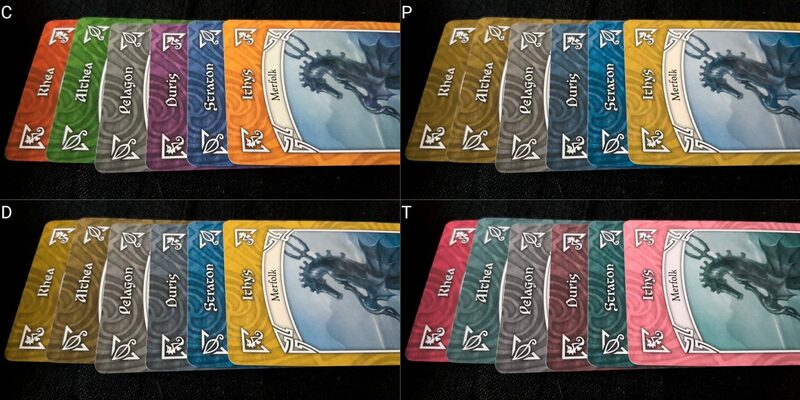 Those for whom total blindness must be considered likely won’t have much fun with Ethnos – the use of a hidden hand of cards along with the supply means there’s a lot of information that is only available visually. The nature of the forced discard after playing a warband means that asking for assistance from another player is going to leak actionable information. If you know someone is building a hand that lets them play one race, you’ll have a fair idea of what they’re going to discard when they finally pull the trigger. For those with minor to moderate visual impairments we can offer a tentative recommendation for Ethnos. Everyone else should likely stay away. Ethnos has an expected reading level but it’s not particularly high and at most you’ll be dealing with only six possible powers in any given game. If this is going to be an issue you can pick the most appropriate races from a set menu and put them together in a way that works for maximum cognitive accessibility. There’s also an expected level of numeracy, and while this is algebraic to an extent in some powers for the most part it’s possible to do a physical comparison. For example, to place a token you need to have one card more in your warband than the number of tokens you have in place in a region. You can map the cards to the tokens and if any are left over you can place a new token. Some racial powers impact on that, but for the most part you can select powers in advance of setup to avoid the issue. More problematic in terms of numeracy is the expectation of at least an implicit understanding of probability. The number of a race left to be drawn is important to know because it will influence the chance you get what you need on a draw from the face-down deck. When you encounter a dragon card, it’s important to have an understanding of how likely it is that another card draw will reveal the second and third. For deciding when to commit to a warband and play it, it’s important to know the way your discards will influence the game for everyone. Cards are played secretly, but those with a good memory can track what people take from the common supply and use that to infer for what races they might looking. Knowing how your discards impact the probability of how others will play is useful although not necessarily vital. The meaning of marker tokens changes depending on context. A token on the orc board means something different to a token on the Merfolk tracker, and in any given game you might have one, both or none of those boards in play. 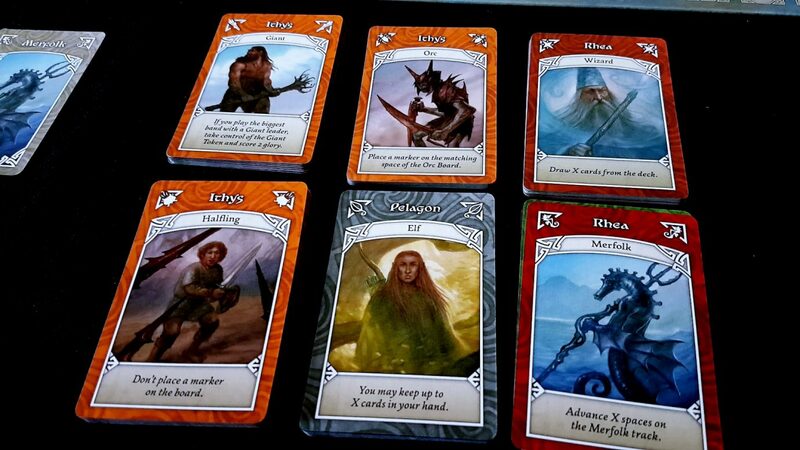 The specific impact of playing particular warbands too will matter – troll tokens and the giant marker change hands depending on the specific composition of the set played. Building up warbands is simple since it’s a case of matching colour or race name, but if basing it on colour there’s an important question as to which race will be the leader. Choosing leaders well based on the game state in front of you is the key skill you need to master in play. Some races work very well together, and it’s possible for some race combinations to chain effects – centaurs let you play another warband which you could then use to trigger another ability. You could even technically play a band of centaurs, then another band of centaurs, then another band of another race still. You have a hand limit of ten, but if you get lucky you might conceivably be able to synergise powers to gain control over three territories in a single turn. Again, you can choose the races with which you want to play to minimise these kind of effects if they are going to be a problem. In doing that you lose a lot of the replayability built into the core of the game systems. Scoring has an unusual rhythm to it – you score territories and warbands at the end of an age, but a few things such as grabbing a giant token earns points right away. Orc raiding bands can be cashed in at the end of an age or allowed to accrue more tokens as time goes by. The difficulty of entering territories increases as the game goes on, and so there’s also a change in how difficult it is to progress in certain parts of the scoring context that the game mechanics themselves don’t emphasise. We’ll tentatively recommend Ethnos in the fluid intelligence category, and recommend it with caveats in the memory category. You spend a lot of time manipulating tokens, and simply placing them within the constraints of a secondary board can be a problem because they are not at all easy to pick up or place. They’re also very light, making them susceptible to being knocked about during play. More of a problem is when you need to play them in territories – on one hand, the constraints there are much more generous. On the other, these tokens stack but with a teenager’s sullen awkwardness. They’ll get knocked over, pushed aside, and collapse into a pile. Since the territories are too small to contain many tokens without stacking, this isn’t really optional. At best you could replace these markers with something more substantial like physical coins or ripped up sheets of very, very thin newspaper. Out of the box though this is a game that is made more difficult to play, irrespective of physical impairment, by the poor quality of the markers you use. Seriously, they feel more like Kinder egg toys than substantive board game components. You’re also dealing with a hidden hand of cards that exhibits a considerable degree of churn because of how playing warbands work. 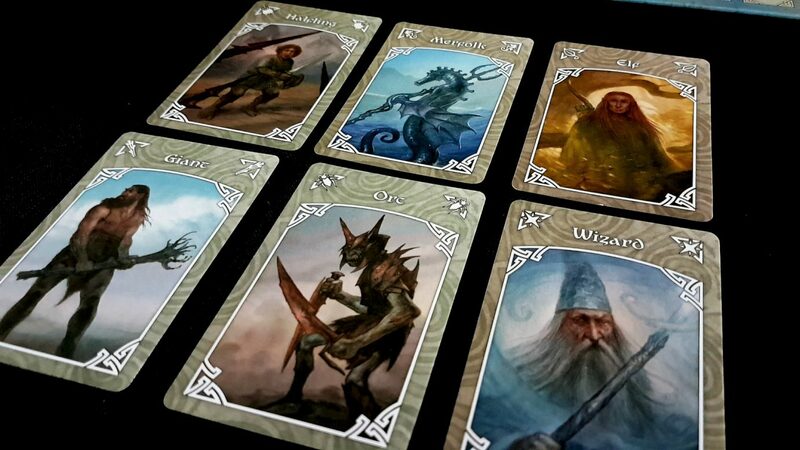 You play your warband, and the order in which you play the cards often matters. You then discard all of your remaining cards (barring racial powers coming into effect) to the common supply. You may have as many as ten cards at a time, and a pair of card holders is likely going to be necessary. A lot of in-hand management is needed, and while a card-holder would make this more cumbersome it would also alleviate the stresses that go along with holding a deck of cards for relatively long periods of time. The game tends to sprawl because you play warbands out for the duration of the age, permitting you to score them relatively rapidly in a single end of round accounting phase. That means you need to have them in your play area, separated into each band, and kept away from the active game components. You could score them immediately but then you lose out on the relative uncertainty of how the scoring will work at the end of an age. It certainly wouldn’t ruin the game, and in circumstances where reaching and stretching may be difficult it would be an effective solution to the problem. If verbalisation is necessary Ethnos makes it possible by giving each region a definitive name and making the way powers work largely unambiguous. If asking someone to play cards from a holder really all you need to give is the number of each card and which is going to be played as the leader. Knowing the capabilities of your hand though is a lot easier if you can rearrange them much like you might with a poker hand. It might be necessary for another player to swap cards around in a holder several times during a round until the situation has become clear enough for a move to be made. Personal boards such as the orc tracker need not be located beside the player that owns them – no secret information is contained on these. We’ll recommend, just, Ethnos in this category because verbalisation is an effective strategy. I just wish I could convince Mrs Meeple to support that for me because I absolutely hate the markers that I have to use. The largest emotional issue here is in playing a warband and having to discard all the rest of your cards. When you reach ten cards you have to play a warband regardless of whether it does what you want, and the nature of the common supply means you’re often simply drawing random cards and hoping for the best. Often your choices are situational, making the best of the hand you have rather than something you might actively be aiming to accomplish. As such, discarding a pile of cards to do something suboptimal can sting on occasion. In a two-player games your opponent directly makes the entry cost of territories larger by their presence. For larger games, you are only prevented from entering a territory by your own markers. The former has a more significant game impact in this category since you can be explicitly and intentionally locked out of a region by someone continually investing in it to make your entry too expensive. The scoring of the ages here makes that more significant since careful planning can result in one person sacrificing a small score in one region in an early age for a larger payout in another in the second. This is never done covertly, and in order to lock up a cheap territory a player will need to risk their hold on others. In three or more player games, a territory is only as difficult to enter as you yourself made it. Other than this, all competition is indirect through scoring tracks or through grabbing cards from the common supply before others can get them. All of this is very passive and since someone can only grab one card at a time their ability to prevent you from getting something is limited. Players can certainly work in concert in that regard, but it’s hard to imagine why it would be in their best interest. Score disparities can be quite high due to the nature of warbands and the simple luck of the draw, but they tend to cluster into more reasonable grades. There is no player elimination, and nothing that realistically counts as a ‘take that’ mechanic. That is unless perhaps we include the ability of the Merfolk to place a marker on any territory in the game as they progress up their scoring track. We’ll recommend Ethnos in this category. There’s plenty of diversity, but its that awkward fantasy diversity that makes this discussion annoyingly difficult. Aside from a few obviously masculine races, it’s hard to really say too much. I mean, it’s ‘Merfolk’ rather than Mermen or Mermaids so that implies a certain inclusion in terms of aquatic aggression. What about the elf? The orc? The halfling? It’s very hard to say from the art and any attempt to be more descriptivist is likely to end up being actively unhelpful. The example rounds given in the instructions vary between genders, and there’s no defaulting to masculinity in the text. 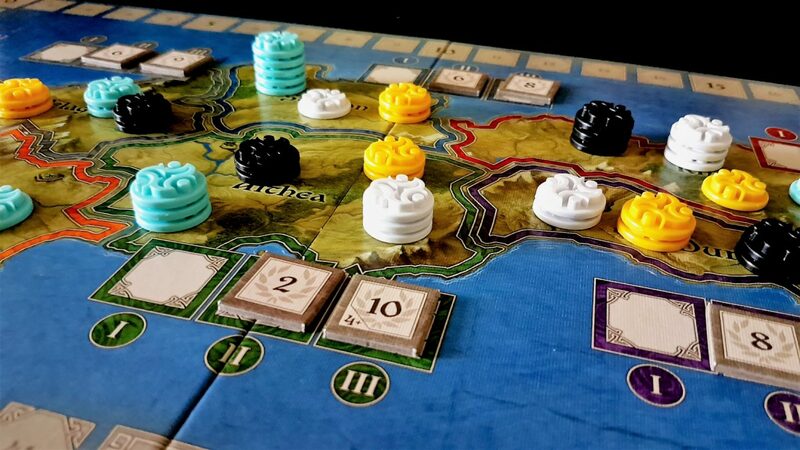 Ethnos has an RRP of £40 which is quite steep given how aggressively cheap all the components feel. It supports up to six players though, and the nature of the randomly generated map and race setup means you do get a lot of variation for your money. The main issue there though is that not all variation is going to work equally well because certain races and combinations thereof have a powerfully negative impact on the game. Still, it’s an easy box to get to the table given its flexible player counts – it works reasonably well regardless of the number of people that may be involved. There is a small need for literacy, but it’s easily resolved with short crib sheets and this will eventually become unnecessary since there are only twelve powers and their effects are relatively easy to memorise. There’s no other formal need for communication. We’ll strongly recommend Ethnos in this category. Colour blindness that intersects with a visual impairment is likely to create enough of a problem in play that we’d rescind our recommendations in both categories. That’s similarly the case with visual impairment and physical impairment, particularly if the latter isn’t significant enough to make verbalisation necessary. Tactile information in the game is useful, but even small issues with fine grained motor control will send the small flimsy tokens cascading out of alignment. The board is easily nudged, and if it’s knocked too hard it’s possible that all those stacks might come falling down. Physical impairments intersecting with a communication impairment would make the game more difficult to play, but not impossible. It would also be playable with a communication regime that allowed players to simply indicate assent or dissent to the options in front of them. Ethnos plays reasonably quickly, and in the games I’ve played it rarely goes beyond an hour. Accessibility considerations will obviously have a bearing here but it’s not a game long enough to necessarily exacerbate issues of discomfort or distress. In the event players find the game dragging on too long, the game reasonably elegantly supports dropping out of play at the end of an age. Placed territory markers can either be removed or left in place – the effect is minimal in either case provided the player count still makes use of the 3+ player rules. Moving from a three-player game to a two-player game is also possible but would likely need some house rules to permit smooth play with the changed territorial control context. 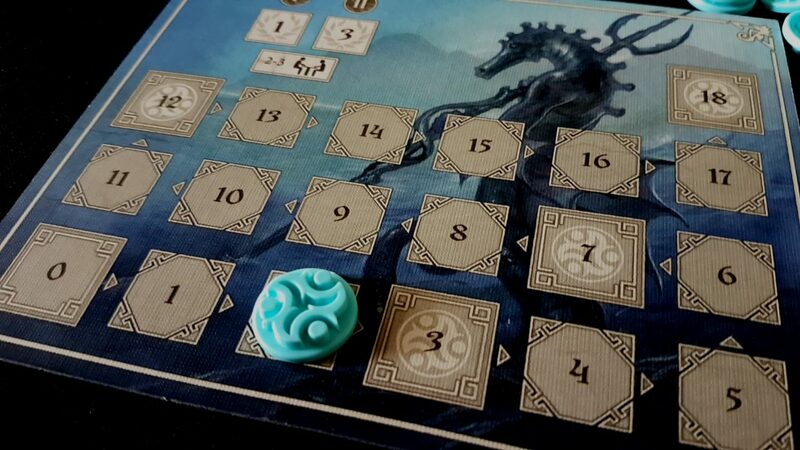 Ethnos actually does a reasonably good job here – some problems for those with visual impairments (and the game is likely inaccessible for those with total blindness), and some concerns about fluid intelligence requirements. Otherwise a relatively solid performance even if there are question marks and caveats threaded all the way throughout this discussion. The quality of the components has come up a fair bit here. Really this is mostly manifested in the control markers that represent pretty much anything you do in the game. They’re so thin that they create an accessibility issue for everyone regardless of impairment. I have seen myself cause a tower of influence to collapse simply by trying to place a marker on the top of a relatively short stack. We weren’t especially taken with Ethnos which is why it got three stars in our review. It’s basically fine, and that extends to its accessibility. Plenty of people were extremely enthused about Ethnos when it was first released. If you are one of them there’s reason to believe you could play it too provided you were willing to make some changes and compensations to smooth over some of the problems. Just don’t try filling your petrol tank with the components regardless of how the name sounds.